This talk will situate research communication in the context of ongoing globalization processes —e.g. increasing mobility, interconnectedness and research networking— in order to address the multiple accountabilities of scientific knowledge dissemination and their ensuing rhetorical exigencies at a time of increasing reliance on new technologies and social networking. Taking this context as a point of departure, I will specifically discuss aspects of genre hybridization, innovation and change in relation to the central (transversal) role of academic languages in the production and dissemination of science. 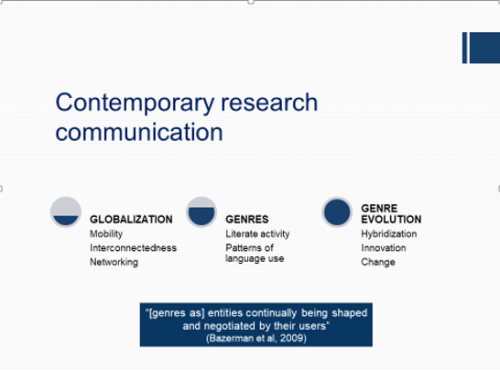 Supporting the view of genres as entities that are continually being shaped and negotiated by their users (Bazerman et al, 2009), I will finally set up a tentative agenda for genres and languages research.